– KX-21 from SYSMEX (Japan)- Latest fully automatic 18 parameter hematology analyzer. 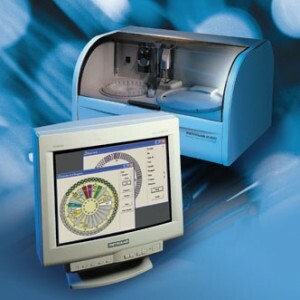 – MICROLAB 2000 from MERCK (Germany)- Computerized biochemistry auto analyzer. – TRANSASIA ERBA INSTALYTE- COMPLETE ELECTROLYTE ANALYZER. – METROLAB 2300 PLUS- Random Access Clinical Analyzer. – LUMAX Hormone Analyzer based on chemiluminescence technology. – MIOS MINI from MERCK(Germany)-Elisa reader for hormone analyses & Elisa tests. We do most clinical pathology, histopathology, FNAC, biochemistry, microbiology and haematology tests including hormones and Elisa tests.